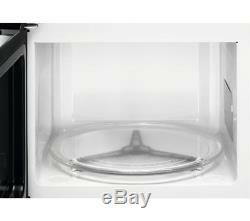 AEG MBB1756S-M Built-in Solo Microwave - Black. Kitchen Appliances > Built-in Appliances > Built-in microwaves. Brand new & pristine product. Top features: - 17 litre capacity for different-sized dishes - Flexible installation to merge with your kitchen layout - Touch display for simple control 17 litre capacity Whether you're reheating leftovers or cooking a quick meal after work, this AEG MBB1756S-M Solo Microwave has a spacious 17 litre capacity which can cook a variety of sized dishes. Flexible installation Easily installed into any cabinet; ventilated or non-ventilated, this microwave is perfect for replacing an old appliance or upgrading your kitchen. Plus, the perfect fit installation method means that this microwave can be installed with just a single tool, taking the hassle out of installation. Touch display Located on the front of the appliance, the smart touch display is functional and easy to clean. Enjoy easy programme selection at your fingertips. Useable capacity: 16.8 litres. Auto cooking programs: 6 auto cook programs including:, Beverages, Fish fillets, Fresh vegetables, Frozen Ready Meals, Frozen vegetables, Jacket potatoes. Auto defrost programs: 4 auto defrost programs including:, Bread, Fish, Meat, Poultry. Number of power levels: 5. Control panel: Touch & dial. Maximum countdown on timer: 90 minutes. Other features: 3 favourite auto menus:, Melt chocolate, Soften butter, Mug cake. Professional installation: Please note this product should be installed by a qualified engineer, such as one of our Knowhow experts. Door hinge location: Hinged on left. 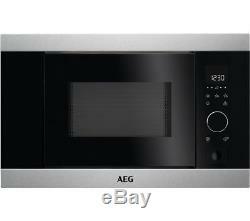 Cord length: 1.4 m. Box contents: AEG MBB1756S-M Built-in Solo Microwave, Installation instructions, Instruction booklet. Internal dimensions: 202 x 285 x 298 mm (H x W x D). External dimensions: 371 x 594 x 316 mm (H x W x D). Boxed dimensions: 475 x 684 x 418 mm (H x W x D). Boxed weight: 18.5 kg. This product has no reviews yet, however see what our buyers say about our other products.. We deliver within the UK only, this excludes the Republic of Ireland, the Scottish Highlands, Okrney and the Channel Islands. To save you the hassle we can take away and recycle your old appliance, along with any packaging when we deliver your new one. Just get in touch and one of our friendly, dedicated team will be happy to assist. We'll reply within 24hours (Mon-Fri, 9-5, excluding Bank Holidays) and do our best to help! Collections direct from our warehouse are not available. Christmas, Easter & Bank Holiday deliveries. These are busy periods for retailers and the postal services. Can't find an answer to your question? If you can't find the answer to your question above, please refer to our "FAQ's" section by clicking here. We're here to help! Where can I return a product? Following The Consumer Contracts (Information, Cancellation and Additional Charges) Regulations, we will accept items back even if you have opened the goods to inspect them. Whilst the goods are in your possession you must take reasonable care of them. In an as new condition - in the same condition as supplied to you - complete with any accessories and free gifts offered with it. In all cases we reserve the right to inspect the product and verify the fault. Reassuring 12 month guarantee on all products. The item "AEG MBB1756S-M Built-in Solo Microwave Black" is in sale since Friday, August 18, 2017. This item is in the category "Home, Furniture & DIY\Appliances\Small Kitchen Appliances\Microwaves". The seller is "currys_pcworld" and is located in Newark.